For the video game, see The Lion King 1½ (video game). The Lion King ​1 1⁄2 (known as The Lion King 3: Hakuna Matata! outside of North America) is a 2004 American animated comedy adventure film produced by the Australian branch of Disneytoon Studios and released direct to video on February 10, 2004. The film was also theatrically released internationally and in selected cities in the United States. As the third film in the Lion King media franchise, the film is chronologically the second in the franchise. It focuses on the meerkat/warthog duo Timon and Pumbaa and their escapades taking place before and during the events of The Lion King. Much of the original cast from the first film returns in this film to reprise their roles, including Nathan Lane and Ernie Sabella as Timon and Pumbaa, respectively. As Timon and Pumbaa watch the original film in a theater, Timon decides to fast-forward to his scenes. Pumbaa's protest over this eventually prompts Timon to share his backstory, going back to before the beginning of the first movie. Timon is a social outcast in his meerkat colony on the outskirts of the Pride Lands due to frequently messing things up by accident. Though he is unconditionally supported by his mother Ma, Timon dreams for more in life than his colony's bleak existence hiding from predators. One day, he is assigned as a sentry, but his daydreaming nearly leads to the near-death of his Uncle Max by hyenas Shenzi, Banzai and Ed. This becomes the last straw for the colony, prompting Timon to leave to find a better life. He meets Rafiki, who teaches him about "Hakuna Matata" and advises him to "look beyond what you see". Timon takes the advice literally and observes Pride Rock in the distance. Believing Pride Rock to be his paradise home, Timon ventures there and encounters Pumbaa on his way. The two quickly form a bond and Pumbaa accompanies Timon. The pair arrive at Pride Rock during the presentation of Simba to the Pride Lands' animals. As they make their way through the crowd of onlookers, Pumbaa explosively passes gas, causing nearby animals to faint but prompting animals further away to bow to Simba. Following this, Timon and Pumbaa make multiple attempts to set up homes throughout the Pride Lands, but wind up being forced away every time after witnessing several events from the original film, such as Simba singing "I Just Can't Wait to Be King", Mufasa's fight with the Hyenas, and Scar's conspiring with the hyenas. Eventually, the pair are caught in the wildebeest stampede that killed Mufasa in the original film, and are thrown off a waterfall. Exhausted, Timon decides to give up, until Pumbaa discovers a luxurious green jungle. The pair finally settle there with the philosophy of "Hakuna Matata". Eventually, Timon and Pumbaa encounter Simba in a nearby desert, nearly dead. The pair rescue him and decide to raise him under their philosophy. Years later, Nala appears after chasing Pumbaa and reunites with Simba. Believing "Hakuna Matata" to be in jeopardy, Timon and Pumbaa attempt to sabotage their dates, but fail. After witnessing Simba and Nala's argument, Simba disappears. Nala explains that he had run off to challenge Scar, and that they need their help. Hurt that Simba left them, Timon unsuccessfully tries to persuade Pumbaa to stay, but Pumbaa follows Simba and Nala. Timon indulges in the jungle's luxuries by himself, but loneliness starts to overcome him. Rafiki appears again and helps Timon realize that his true Hakuna Matata is with the ones he loves, prompting Timon to take off after Simba, Nala, and Pumbaa. Timon catches up and reconciles with Pumbaa, before they journey onward to Pride Rock. After helping Simba and Nala distract the hyenas, Timon and Pumbaa run into Ma and Uncle Max, who came looking for Timon. Timon proposes that they all help Simba by getting rid of the hyenas. Whilst Simba battles Scar, Ma and Uncle Max are directed to construct a series of tunnels beneath the hyenas, and Timon and Pumbaa use various tactics to distract them while the tunnel is being made. When the tunnels are finished, Max knocks down the sticks, breaking the ground under the hyenas. However, the last few get stuck, prompting Timon to dive underground and break them himself. The cave-in commences, and the hyenas are ejected through the tunnels. Immediately afterwards, Scar is defeated by Simba. Simba accepts his place as king of the Pride Lands, thanking Timon and Pumbaa for helping him. Timon takes Ma, Uncle Max, and the meerkat colony to live in the predator-free jungle to complete his "Hakuna Matata"; and he is praised as their hero. 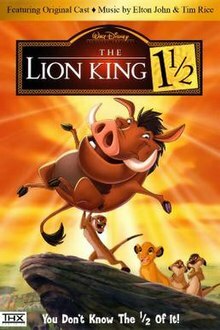 Once Timon finishes his backstory, Ma, Uncle Max, Simba, Rafiki, and eventually many other Disney characters join him and Pumbaa to rewatch the film in the theater in which Pumbaa tells Timon that he still doesn't do well in crowds. Nathan Lane as Timon, a meerkat who is Pumbaa's best friend. Though somewhat selfish, arrogant, and withdrawn, Timon shows courageous loyalty towards his friends. Lianne Hughes and Alexs Stadermann served as the supervising animators for Timon. Ernie Sabella as Pumbaa, a warthog who is Timon's best friend. Though slow-witted, he is very empathetic and willing to trust and befriend anyone. He is also claustrophobic and passes gas in crowds. Bob Baxter served as the supervising animator for Pumbaa. Matthew Broderick as Simba, Mufasa and Sarabi's son, Scar's nephew, Nala's husband and the current King of the Pride Lands. Matt Weinberg voices Simba as a cub. Bob Baxter served as the supervising animator for Simba. Julie Kavner as Ma, Timon's caring mother. She is overly protective and attached to her son, often trying to get him accepted amongst the colony, but never succeeding. Lianne Hughes served as the supervising animator for Ma. Jerry Stiller as Uncle Max, Timon's paranoid, eccentric but deep down kind-hearted uncle. He initially doubts Timon's ability, but warms up to him at the film's climax. Lianne Hughes served as the supervising animator for Max. Moira Kelly as Nala, Simba's childhood friend and eventual wife. Most of her dialogue is archived from the original film. She only has one scene with newly recorded dialogue. Whoopi Goldberg, Cheech Marin and Jim Cummings as Shenzi, Banzai and Ed, a trio of spotted hyenas who act as the local predators of Timon's meerkat colony before their allegiance with Scar. Bob Baxter served as the supervising animator for the hyenas. Robert Guillaume as Rafiki, a mandrill who teaches Timon Hakuna Matata, as well as giving him faith in himself to do what he dreams of doing. Alexs Stadermann served as the supervising animator for Rafiki. Edward Hibbert as Zazu, a red-billed hornbill and the resolute adviser of the Lion King. In April 2000, it was announced that the Walt Disney Company selected Jeff Ahlholm, Colin Goldman, and Tom Rogers to write the script for The Lion King 3. It was scheduled to arrive in video stores sometime in 2001. In May 2003, The Lion King ​1 1⁄2 was scheduled for home video release in early spring 2004 with Nathan Lane, Ernie Sabella, and Matthew Broderick reprising their original roles, and Elton John and Tim Rice returning to compose a new song, "Meerkat Rhapsody". The film was animated by Walt Disney Animation Australia studio in Sydney, Sparx and Spaff Animation. Upon its initial home video release, The Lion King ​1 1⁄2 was accompanied by with a marketing campaign tie-in with McDonald's with six Happy Meal toys: Simba, Rafiki, Timon, Pumbaa, Mufasa and Ed. In May 2003, the DVD edition was confirmed to include music videos, deleted scenes, behind-the-scenes views of how the movie was made, and two featurettes: Timon -- The Early Years; a mockumentary tracing Timon's childhood through tongue-in-cheek interviews with family and friends; and Disney's Funniest Moments, highlighting Disney animated characters from the Seven Dwarfs to Brother Bear. Two games are also featured, including a virtual safari backlot tour through the Pride Lands and a Lion King trivia game in the format of Who Wants to Be a Millionaire, titled Who Wants to Be King of the Jungle?, and hosted by Meredith Vieira, then-host of the current U.S. syndicated version. The Lion King ​1 1⁄2 was released on February 10, 2004. On its first day of sales, the film sold 1.5 million DVD units, and in its first three days of release the film generated about $55 million in sales revenue, 2.5 of which were DVD copies of the film. By March 2, 2004, six million DVD and VHS copies of the film had been sold in North America. The movie was released as part of a 3-movie box set along with The Lion King and The Lion King II: Simba's Pride on December 6, 2004. In January 2005, the film, along with the other Lion King movies, went back into moratorium. The film was first released on Blu-ray as part of an eight-disc box set on October 4, 2011 along with the other 2 films. The movie later received a separate Blu-ray release as well as a standard DVD release on March 6, 2012, along with The Lion King II: Simba's Pride. The Blu-ray and DVD releases, along with Simba’s Pride and the Diamond Edition release of The Lion King, were removed from release on April 30, 2013. On Rotten Tomatoes, the film holds a 76% approval rating based on 17 reviews, with an average rating of 6.4/10. Frank Lovece of TV Guide gave the film ​3 1⁄2 stars out of 4 stating that "This retelling of The Lion King (1994) from the point of view of comic sidekicks Timon (voice of Nathan Lane) and Pumbaa (Ernie Sabella) is one of the rare Disney direct-to-video sequels worthy of the original." He went on to say that 'the only aspect of the film that feels forced is the revisionist positioning of Timon as young Simba's step-dad, which has no emotional echo in the first film. The quality of the animation is surprisingly impressive; some static backgrounds are the primary concession to a small-screen budget and the fluid character movements and expressions are vastly superior to those of, say, The Lion King's Timon and Pumbaa TV cartoon series.'" Joe Leydon of Variety gave the film a positive review writing "toddlers and preschoolers will be equally enchanted and amused by colorful toon shenanigans." Los Angeles Times article writer Susan King wrote that "Because Disney's made-for-video sequels to their classic animated films have been mediocre at best, expectations for this new sequel to the mouse house's 1994 blockbuster were slim. But thanks to a clever story line, snappy dialogue that kids and adults will enjoy, a couple of decent new songs and the return of the original voice actors, Lion King ​1 1⁄2 is an irreverent gas." Many reviewers have suggested that the film was influenced by the Tom Stoppard play Rosencrantz and Guildenstern are Dead, which follows Rosencrantz and Guildenstern, two minor characters from Shakespeare's play Hamlet, and details their experiences taking place during the same time as the events of Hamlet, similar to what the film does with its predecessor, which has been similarly compared to Hamlet. The film's soundtrack album contains 2 original songs; "Diggah Tunnah Dance," written by Lebo M., who helped write many of the songs for the original film, and "That's All I Need," written by Elton John and Tim Rice, who also worked on the first film. The latter song, which is performed by Nathan Lane in the film, is largely based on a cut song from The Lion King titled "The Warthog Rhapsody," with which it shares a similar melody. The film features the song Hakuna Matata from the first film, which is featured both as the original soundtrack recording in the soundtrack album and in the film as a new cover performed by Nathan Lane and Ernie Sabella. The soundtrack also consists of various covers of pop songs, such as Hugh Masekela's Grazing in the Grass performed by Raven-Symoné, Kool and the Gang's Jungle Boogie performed by Drew K. and The French, and The Lion Sleeps Tonight (which appears briefly in the original film as well) performed by Lebo M. and Vinx. Other songs featured in the film that aren't in the soundtrack include the song "Sunrise, Sunset" from the musical Fiddler on the Roof and the eponymous theme song from the television show Peter Gunn composed by Henry Mancini. The film contains original score composed by Don Harper, and also features the instrumental theme "The Good, the Bad and the Ugly" composed by Ennio Morricone. A video game based on the film was published in 2003 for the Game Boy Advance, featuring Timon and Pumbaa as the playable characters. ^ Lyons, Charles (April 12, 2001). "Disney taps cubs to pen direct-to-vid 'Lion King 3′". Variety. Retrieved August 24, 2014. ^ a b Villa, Joan (May 9, 2003). "Dis fills 'Lion' gaps with '1 1/2'". The Hollywood Reporter. High Beam. Archived from the original (Fee required) on October 31, 2014. Retrieved August 24, 2014. ^ DeMott, Matt (February 5, 2004). "McDonald's Happy Meals Feature Lion King 1 1/2 Toys". Animation World Magazine. Retrieved August 24, 2014. ^ "Disney DVD and Video Newsletter - The Lion King 1½" On DVD And Video February 10". Disney. February 2004. Archived from the original on August 14, 2011. Retrieved 4 March 2017. ^ Ball, Ryan (February 10, 2004). "Lion King 1 1/2 Continues Circle of Life". Animation Magazine. Archived from the original on March 4, 2017. Retrieved March 4, 2017. ^ Ball, Ryan (February 12, 2004). "Lion King 1 1/2 Sells 1 1/2 Million". Animation Magazine. Retrieved March 4, 2017. ^ Herrick, Scott (February 15, 2004). "'Lion' sequel DVD roaring". Variety. Retrieved August 24, 2014. ^ Ball, Ryan (March 2, 2004). "Lion King 1 1/2 Tops 2004 Sales". Animation Magazine. Retrieved March 4, 2017. ^ "Out of Print Disney DVDs". UltimateDisney.com. ^ "Audiences to Experience Disney's "The Lion King" Like Never Before". PR News Wire. May 26, 2011. Retrieved May 26, 2011. ^ Lui, Ed. "Lion King 1 1/2" and "Lion King 2" Coming to Blu-ray, DVD, and Digital on March 6, 2012". Toon Zone. Archived from the original on February 2, 2012. ^ "The Lion King 1 1/2". ^ "The Lion King 1½ Movie Reviews, Pictures". Rotten Tomatoes. Flixster. Retrieved August 24, 2014. ^ a b Leydon, Joe (February 10, 2004). "Review: 'The Lion King 1½'". Variety. Retrieved August 24, 2014. ^ King, Susan (February 12, 2004). "Rip-roaring 'Lion' retelling". Los Angeles Times. Retrieved August 24, 2014. ^ Willman, Chris. "The Lion King 1½". Entertainment Weekly. Retrieved February 20, 2004. ^ "Lion King 1 1/2 Original Soundtrack". AllMusic. Retrieved June 21, 2017. ^ "The Lion King 1½ Game Boy Advance info/review". GameSpot. Archived from the original on August 8, 2009. Retrieved August 7, 2008. ^ Disney Interactive (October 7, 2003). "Kids Play inside the World of Hakuna Matata with ``Disney's The Lion King 1 1/2 for Game Boy Advance and ``Disney's The Lion King PC Game Collection". Business Wire. Archived from the original on March 4, 2017. Retrieved March 4, 2017.